WHAT SOCIAL MEDIA SITES DO YOU USE? / WHAT IS YOUR FAVOURITE SOCIAL SITE TO USE? 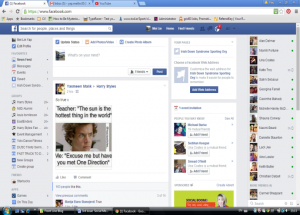 Mei Lin’s latest column looks at the most popular social networks and how to make the best of them. Mei-Lin discusses social media from Youtube to Facebook and more. She advises us to enjoy it and stay safe while online. This is her 3rd article for Frontline. 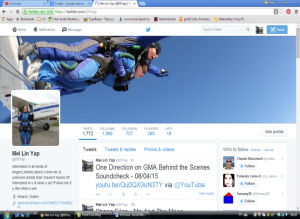 The social media sites that I use are YouTube, Twitter, Facebook, LinkedIn, Pinterest, and Google Plus. I love the hype on YouTube as there is a huge variety of videos to watch and/or listen to. This is my way of connecting with other people around the world. It is free to join up and is easy to create a free account. I find using YouTube is fun. I watch videos that interest me. I get to share what I am watching with others on other social media sites. I like to share my opinion on what I am watching and listening to on YouTube. I like to link videos to Twitter. There is always something on YouTube for everyone to enjoy. I spend a lot of time on YouTube. I log on during the day when I am at home and I sometimes like to stay up late at night. I feel excited to connect with others and the things that interest me. It makes me feel good about myself- I sometimes get carried away and time just slips by, but I very much enjoy being on social media. If you don’t understand how to join up, just follow the images below and hopefully you will understand how it is done. 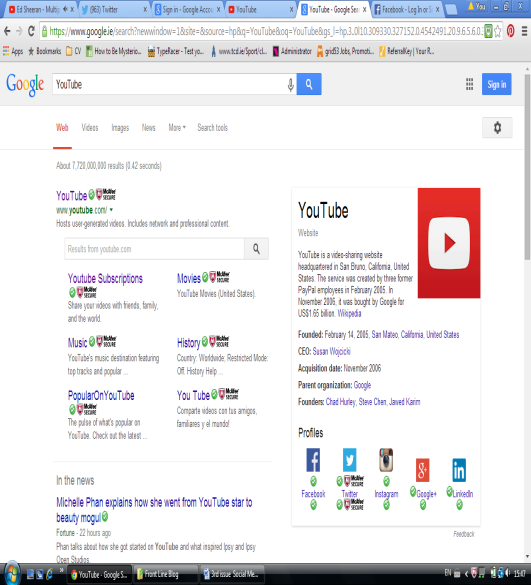 As you can see here, all you have to do is just type “YouTube” into the “Google” search engine; just press the enter key, and the link will pop up (Screen A below). 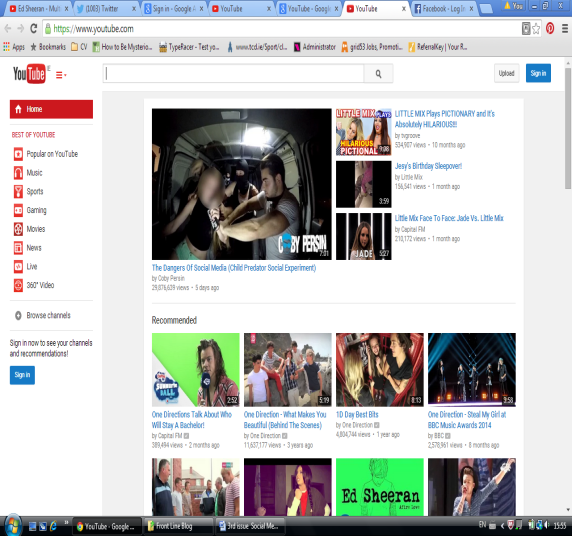 Screen B shows the “HomePage” to YouTube. 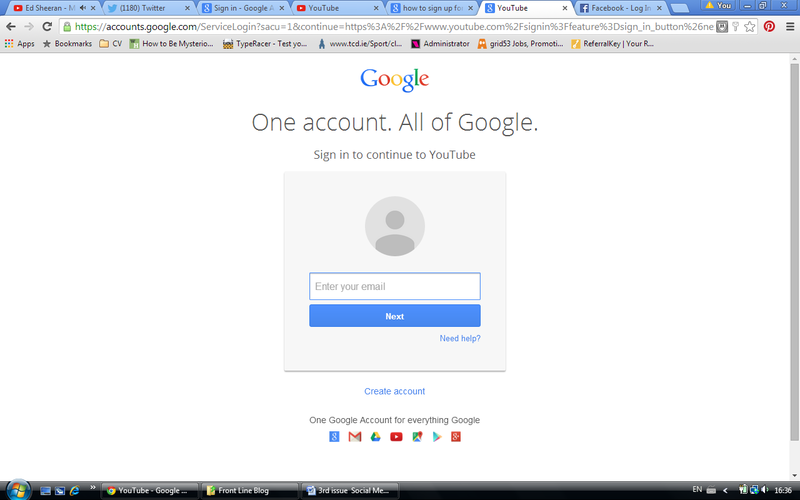 On the homepage, click “Sign In” on the upper right corner of YouTube. When you sign in, you have the option to add an account. When you click into it, the third image (Screen C) will pop up, and just follow the instructions. When I came upon Twitter, I wasn’t sure if I wanted to sign up. I thought why not sign up and see what the fuss is about. When I did sign up, I was confused about how Twitter works and I didn’t really understand the lingo of the Twitter world. When I did enter the Twitter world, I knew that I would love the interaction and building friendships with the people that I was interacting with. I have an interest in what other people do, in people’s lives, and I like to know what other people’s interests are. This just came naturally to me. 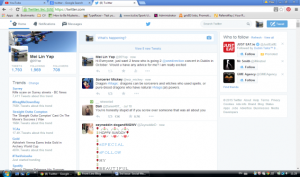 I got to understand what Twitter was about and how everything works on the site. From entering the Twitter world I knew that I would love the hype of it, and spend a lot of time on it. At first I was following everyone on Twitter, but later on decided that it was probably not a good idea to follow everyone. I decided that I was doing it all wrong by following celebrities and others. I thought; why not get them to follow me instead. So I un-followed everyone and then went onto YouTube to start posting things to Twitter. I love the buzz that I get from watching/listening to YouTube videos, and the hype that I get from posting the stuff to Twitter. I hoped that people out there would like what I put up. I was excited at the prospect of people “favouriting” and “re-tweeting” and commenting on the things that I put up. I posted things up from YouTube to Twitter. Twitter and YouTube have a huge variety of things that interest me. I also liked the idea that many people around the world are on Twitter and I could connect with them. Sometimes people with intellectual disabilities can feel isolated and social media is a great way to feel connected and engaged. If you are not already on social media and would like to get started, just follow the instructions by looking at the images below. This should help you sign up and create an account. 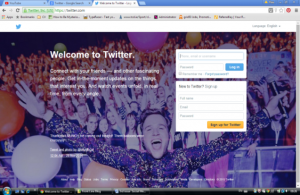 Firstly I would go into Google search engine and type in the word “Twitter” and press “Enter” on the key pad. You can either click on the word “Twitter” or you can just follow this link here, https://twitter.com and it will appear. You just enter your details; make sure you have an email address also, as you will need that to sign up. Once you have registered and signed in, you will be brought to your own home page. Here is an example of mine so that you know what it looks like. You just click on icons to “follow” a person who interests you. This will display all their “tweets” on your screen. You may also go into their “Profile” and take a look. Have fun! The following image is my profile. If you like you can follow me – this is what my profile looks like. If you follow these images, Screen A is Twitter on which you can find information regarding safety procedures. 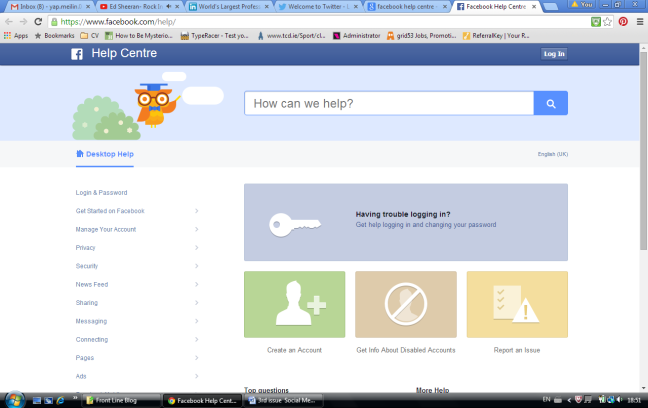 On Screen B is Facebook’s Help Centre; this is where you will find information about safety, and managing your account. 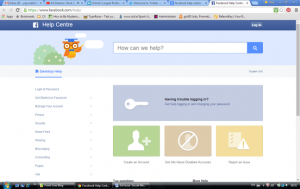 Here is the link to the Help Centre on Facebook: https://www.facebook.com/help/. If you want to engage with social media, it is very important to keep yourself safe. When you have created your account, there is an image on the top right hand corner with a drop down menu. 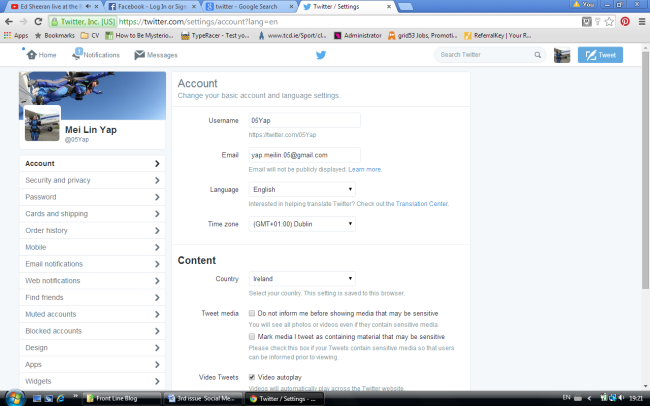 If you go into “Settings” it will give you lots of information on how to keep safe. It is very important to remember not to publicly post your phone number, your address or any other personal information on Twitter or Facebook. 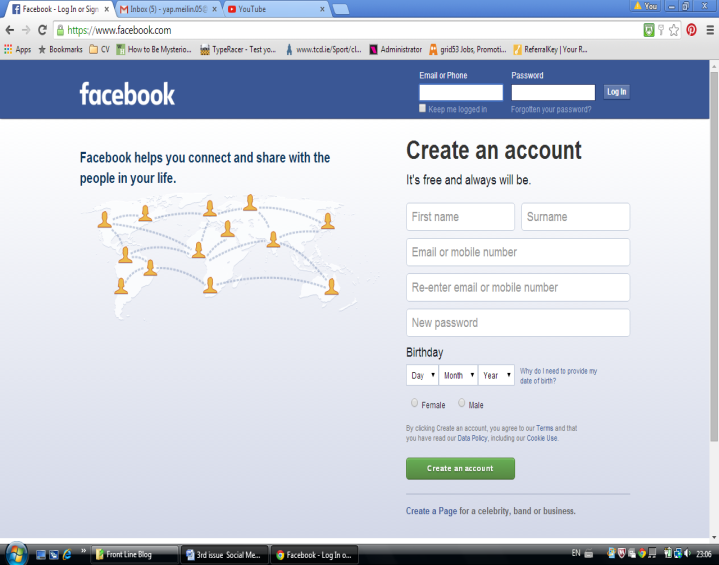 Facebook is a social networking site where you can interact, build friendships, and stay connected with people that you may know. I love to interact with people that I know, and I like knowing what other people do, and knowing what other people’s interests are. Being on Facebook helps me stay connected with friends / family / relatives that don’t live nearby. It is also nice to reconnect with people that you may know from the past. 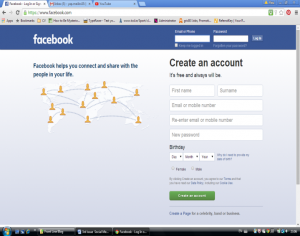 Facebook also helps me to stay connected to my interests, and it is a way of chatting with friends. 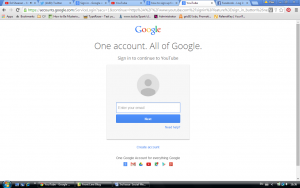 I created my account back in 2002 – it is easy to create an account, just follow the instructions. Be Safe, Have Fun, Stay Connected!! Mei Lin Yap lives in Dublin. She works as a Reception Greeting Co-ordinator, and writes regularly for Frontline Ireland. She was formerly Rollout Support Officer/Ambassador for the Certificate in Contemporary Living at The National Institute for Intellectual Disability, Trinity College Dublin. 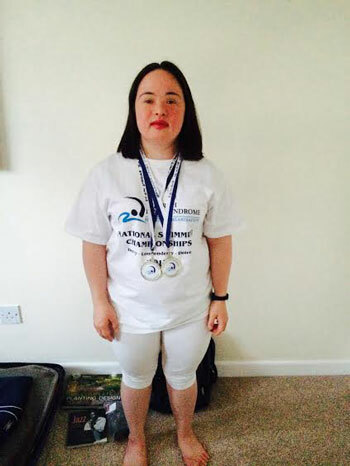 Her passions include Special Olympics and inclusion for everyone.